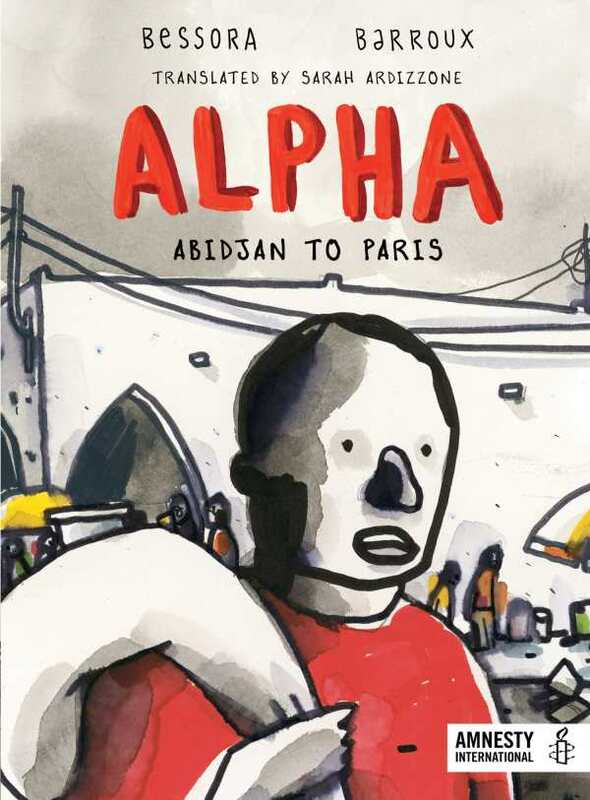 Inspired by the stories of refugees, Alpha is a moving and important account of the risks and hardships braved by illegal immigrants seeking a better life. A man’s extraordinary efforts to reunite with his family are the basis of Bessora and Barroux’s graphic novel. Alpha Coulibaly is living in Abidjan, a major city of Côte d’Ivoire (Ivory Coast) in Africa. He longs to reunite with his wife, Patience, and their young son, Badian, who have gone ahead to Paris, where Patience’s sister runs a hair salon. The thin hope of a better life in Europe is enough for many immigrants, including Alpha, to brave the daunting legal and physical obstacles that stand in the way. Working whatever jobs he can find, saving money for months before he can afford the next leg of the trip, Alpha travels through Mali, to Algeria, to Morocco, and finally to Europe. Illegal? What does that even mean? For me, we’re adventurers. Indiana Jones would have died eight times over if he’d had to endure what we experience every day. Indeed, Alpha and his companions are faced with a steady stream of life-or-death decisions: Which smuggler to trust? Which route to take? How to avoid being deported? Barroux’s art is a fine-tip pen wash—one or two simple but affecting images to a page, masterfully composed. While immigration may be a contentious political issue, Alpha reminds us of the people behind the headlines: those who inhabit the smugglers’ compartments in rickety trucks, pay for fake passports, and trust their lives to boats that are barely seaworthy, all in search of a better future for themselves and their families.